Ethno-religious minorities in Iraq have been subjected to ethnic strife and the ravages of war. These ancient Christian people once numbered more than 1.5 million, but today are fewer than 400,000. As a human rights advocate and the daughter of immigrants who fled anti-Christian violence in this part of the world, Rep. Eshoo has been a leader in bringing attention to the plight of Iraq's minority communities. Together with Rep. Frank Wolf, Rep. Eshoo co-founded and co-chairs the Caucus on Religious Minorities in the Middle East. She has been instrumental in obtaining funds to assist the ethno-religious minorities in Iraq. As a result of her efforts, the U.S. Department of State has provided $10 million in assistance to fund a range of medical and infrastructure assistance programs in the region for each of the last several appropriations cycles. Rep. Eshoo has also worked to ensure adequate refugee assistance for the many ethno-religious minorities who have fled Iraq and dispersed throughout the United States. In November 2009, Rep. Eshoo provided special testimony for the Foreign Affairs Committee and the Appropriations Committee concerning the plight of ethno-religious minorities and the crisis related to the ongoing violence against these groups in Iraq. She joined with Rep. Gary Peters to request additional funding for the Nineveh Plains region in Fiscal Year 2011. She also joined other Members in passing a resolution on the need for the international community to focus on Christian minorities in Iraq. Following the devastating October 31, 2010 attack on Our Lady of Salvation Assyrian Catholic Church in Baghdad, which left more than 50 clergy, worshipers and police dead, Rep. Eshoo sent a letter to Secretary of State Hillary Clinton requesting an overdue clarification of the Administration's policy on Iraq's minorities, requesting the articulation of a comprehensive strategy for their protection. The State Department's response is available here. In response to continuing concerns in the diaspora, faith and advocacy communities that the distribution of funds to protect Iraq's minorities has not been sufficiently transparent, Rep. Eshoo led a letter, joined by more than a dozen House colleagues and four Senators, asking the Government Accountability Office (GAO) to investigate the mechanism the State Department and USAID use for providing this aid. The investigation is ongoing, and Rep. Eshoo hopes that the results will pave the way for a more effective distribution of development and relief funds. In January 2011, she testified before the Lantos Human Rights Commission on the plight of endangered minority groups in Iraq. 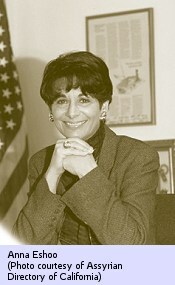 Following the testimony, she worked with Members of the Commission, including co-chair Rep. Frank Wolf, to draft a letter to the Adminstration requesting the appointment of specific officials at Embassy Baghdad and Embassy Cairo to coordinate efforts on behalf of Iraqi and Egyptian minorities. She also joined with Rep. Frank Wolf and numerous other Members in introducing bipartisan legislation to create a Special Envoy for Religious Freedom of Religious Minorities in the Near East and South Asia. That legislation, H.R. 440, has been referred to the Foreign Affairs Committee, and she continues to work for its passage. On April 13, 2011, Rep. Eshoo provided testimony to the State and Foreign Operations Subcommittee of the Committee on Appropriations, once again requesting support for humanitarian development and relief targeted at Iraq's ethno-religious minorities in Fiscal Year 2012. She continues to conduct vigorous oversight of the Administration's handling of this issue in an effort to garner greater attention for it.